// Also add somewhere for the used images, // to secure image-load before script-run. 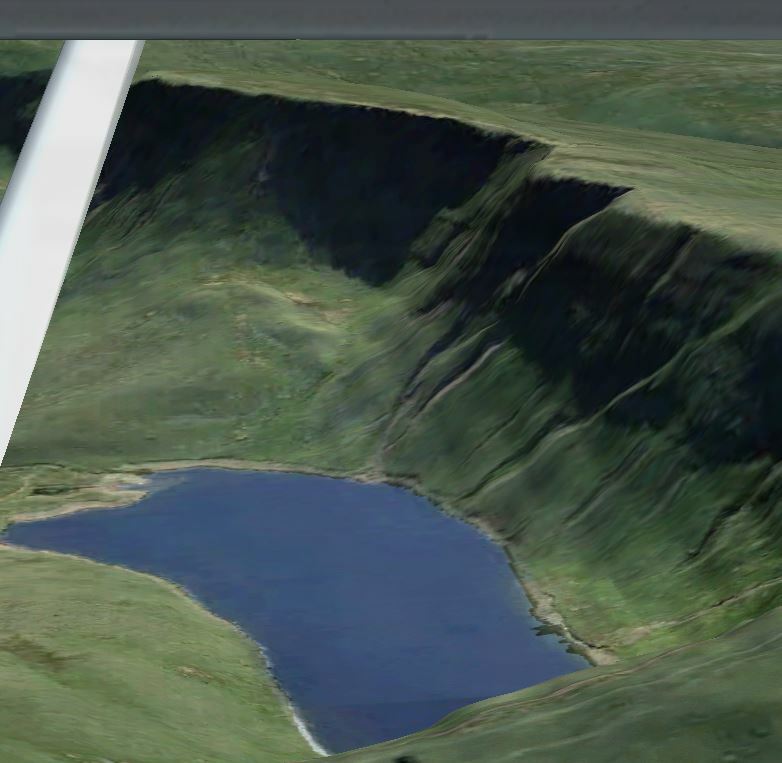 I made this page for my own sim-flying in Wales. It may be useful for others too, so I put into Internet. 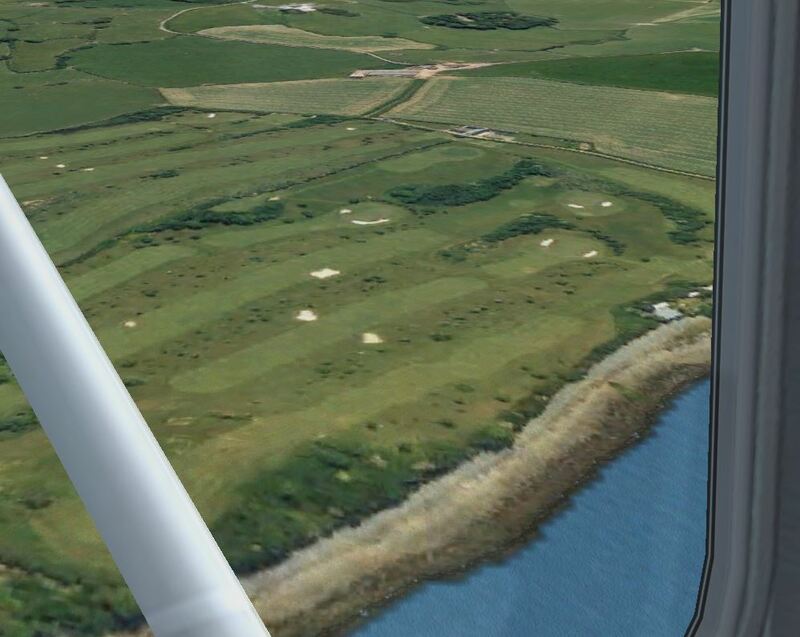 - Scenery used is Just Flight VFR Real Sceneries, Vol 3 Wales & South West England, for FSX Steam. Contents: About photo sceneries. Objects well visible. Added landmarks. Flight tours. Maps. Best aircrafts. Airfields & NDB/VOR. Links. Refs. 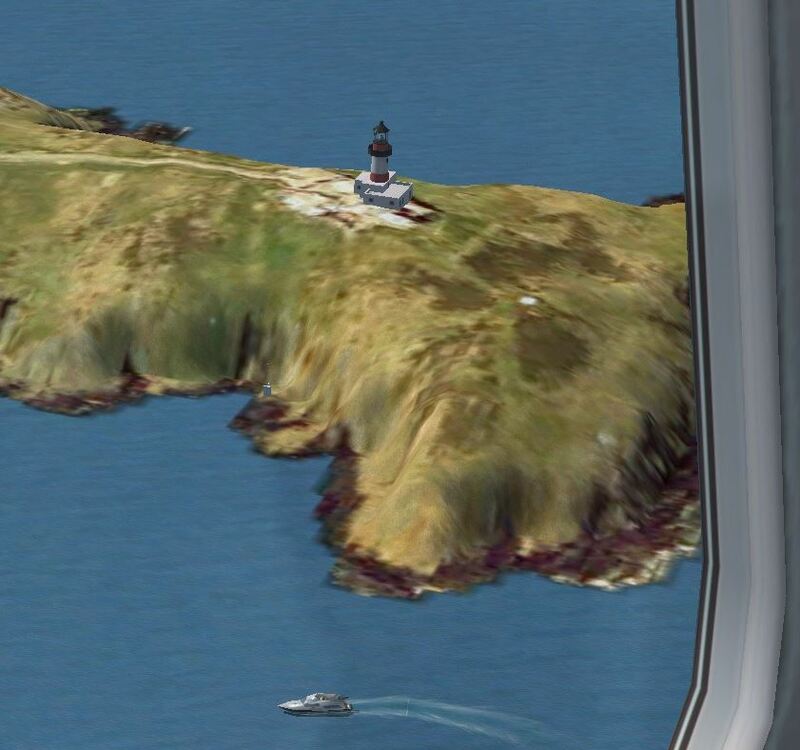 Wales is excellent for flights with FSX photo sceneries! - One sees footpaths and railway winding up to the top - real photos! When are photo sceneries good and when bad? 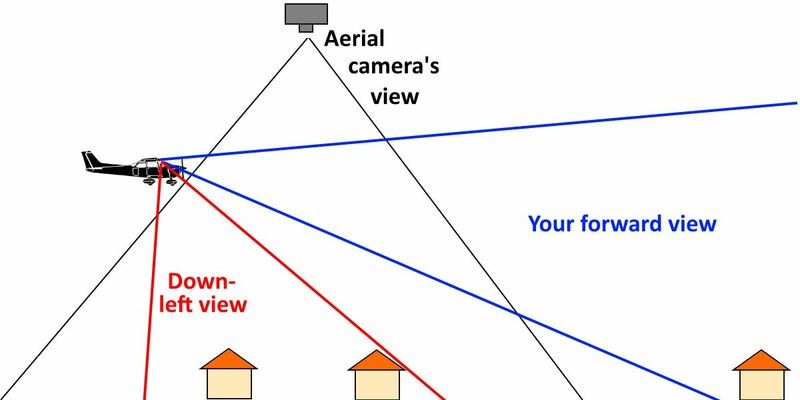 Aerial photos are taken downwards, not forwards. When we fly and look forwards it works well for relatively flat objects like gravel, grass, bushes etc. that tightly follow ground height variations, but not so good for buildings since we recognize them by their walls, not by their roofs! Note also that it is when you look down-left from your aircraft that you come closest to the aerial photo view. In future, we will probably get faithful 3D represen­tations of all buildings! Aran Fawddwy 907m, Brecon Beacons 886m. slate tiles for roof covering to all of UK! - Sandy beaches and tidal flats - e.g. around Swansea. The aerial photos were often taken at low tide. - Shore lines with steep cliffs. Mind though that textures can get rather stretched. fairways and greens. Wales has many golf courses! Ffestiniog, Talallyn, Vale of Rheidol, Snowdon Mtn. Small lakes once created from glaciers, e.g. Llyn y Fan Fach in Brecon Beacons mountains. Reservoirs, for some one can also see its dam. Tidal flats west Swansea. Cliffs with lighthouse. - Airfields improved with buildings & aircrafts. - Wind farms, each with many wind turbines. - Oil refineries in the UK, by Gerry Winskill. Three in Wales around Milford Haven. - Medieval castles of North Wales (6) by Chris Reynolds. - Castles is South Wales (8) added by me (to be improved), using Chris' models. - Lighthouses around Wales' coast (18) by me, Bo Justusson. At significant capes, with FSX standard objects. Barmouth bridge added by me. - Dams: Stwlan dam and power station, 3NM SW Ffestionog, by Chris Reynolds. - Obstacles, ANO in UK by Gerry Winskill. Here, masts & pylons in Wales (~12). - Industries, a few added by me. 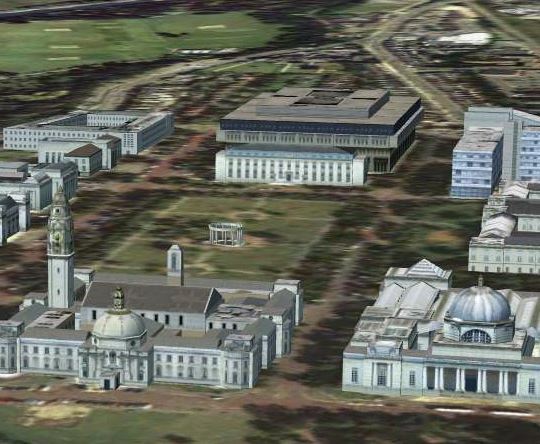 - Cardiff City Landmarks, by David Morgan - detailed models of Stadium, Castle, University, museums and other prominent buildings, and also high modern buildings. Very professional! - Ships: 4 tankers Milford Haven, 2 ferries Holyguard, 1 ferry Fishguard. By Bo Ju. 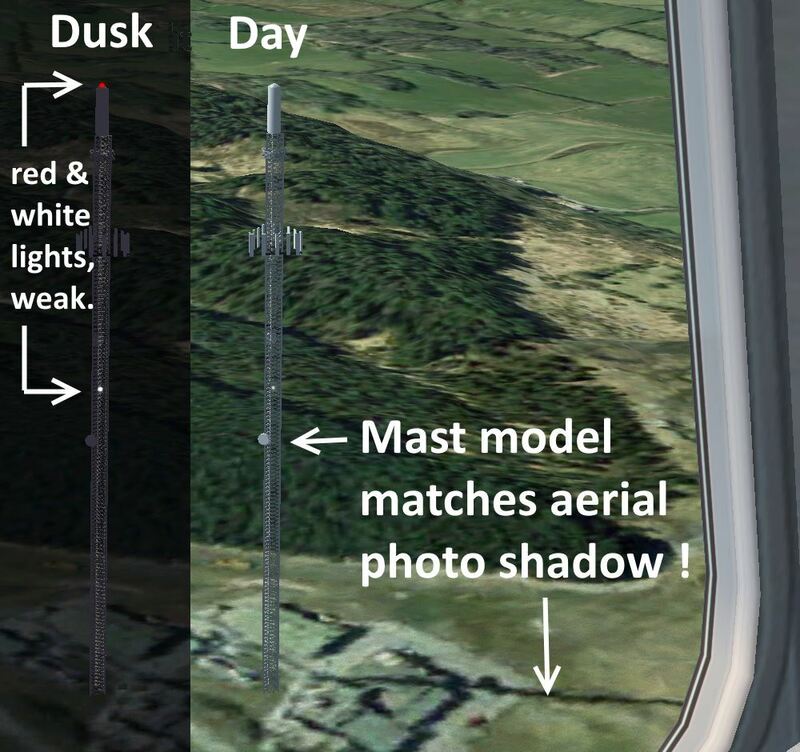 Radio mast - model matches photo! Cardiff City Landmarks. These are combo files with free scenery data from many sim developers. Their documentations are included in /docs directory. More • References below. (or other directory, for FSX Steam it must be under /FSX ). navigate to /Wales_airfields_bj and click OK. There is a bug in FSX so the window does not disappear. Bug-fix is to click in any white space. - Check which active sceneries to use - unmark the others. Too many active ones may give problems/collisions. - Test! - Free flight from e.g. Caernarfon airfield. Tour 2. Zig-zag Snowdonia: Caernarfon - east into Llanberis valley with large Dinorvic quarry, fly beside Snowdon Mt, with well visible pathways. Turn left, and then west into Nant Ffrancon valley to Penhryn quarry. Onto the southern valley with pass Aberglaslyn. Turn right and return to Caernarfon. It is easy to get lost! NDB 320kHz in Caernarfon can help. Tour 4. Navigation inland: Hawarden - Brenig Reservoir - Bala lake - Chirk castle - Criggion secret radio station (WW2-2001) - Welshpool. More difficult, no coast to follow! Use map below to measure heading and distance for each leg. Check flying-time - 2 NM/min! ~68NM. i Visit Wales Railways i Google Maps, search by names Tour 5. Four railways: Aberporth - N along coast, pass wind farms, check Vale of Rheidol Rwy, and Talallyn Rwy (not in the big valley! ), and Ffestiniogg Rwy, large quarry, then fly to Snowdon top and follow Rwy down, land at Caernarfon. ~105NM. Tour 7. Southern coast: Swansea - west to Worms Head cliffs, east to Port Talbot industrial site, pass St Athans and Cardiff airports, over Cardiff City (prominent buildings! ), Severn bridges, back to Cardiff Airport (detailed!). Tour 8. Breacon Beacon mountains, search for ruins and lakes: Pembrey, Kidwelly castle, Carreg Cennen ruin - Llyn-y-fan-Fach small lake - Brecon Beacon top - Black Mountains - Llanthony Priory ruin - Hay (booklovers town) - Shobdon. Difficult! ButtonDown - Drag - Release. | Repeat, or Clear with click. Zoom: Ctrl+/-. Map image jpeg files - click for direct load if needed: About the map, see Refs below. Photo sceneries are best seen form a low-speed aircraft with free view both forward and down left, and from altitude 1000 - 3000 ft. Hence, avoid jet airliners, jet fighters, DC-3, and also Piper Cub (its wings limit the view). Cruising speed: 120 Knots (NM/h) = 2 NM per minute. Cessna gives you a good view down left, where aerial photo sceneries look best, since aerial photos are taken downwards! A lively and sturdy aircraft with STOL properties. Its extra low side-windows gives a very good view both down-left and down-right! Cruise speed 142 knots = 2.4 NM/min. It has no ADF for NDB beacons. A simple fix is to replace its panel.cfg by this download: panel.cfg with ADF, only 2 lines changed! - You must set NDB frequency in radiostack window: Shift-2 . Junkers W33 - free download, made by Hauke Keitel and Rolf-Uwe Hochmuth. Open cockpit, slow and old-fashioned! Speed: 185 km/h = 100 Knots (NM/h) = 1.7 NM/min. - Problem in rain: windscreen grey and not transparent. Dragon Rapide - free download. An old-timer with a real glass cockpit - it is like sitting in a glass-house! Of course, no fancy computer stuff in that aircraft. Good view out front, fairly good down-left. Cruising speed: 100 Knots (NM/h) = 1.7 NM/h. - Bug for ADF: change of digits is placed too low, and - above +. It helps somewhat to use: View-Cockpit-Panel. In FSX original, small airfields have none or very few buildings. Larger airports are better, e.g. Cardiff. I have collected airfield addons into one file, see above. Contributions: Alf Denham has made addons for many small UK airfields, five in Wales. Terry Shields has a detailed scenery for Cardiff airport. Plus material from several others. You can buy large collections of airfields, e.g. - Just Flights UK airfields or UK2000. - Sim720's Caernarfon, airphotos + trees and houses, at Steam. To-day: For airfield data and navigation aids to-day, in real life, see • Links - SkyVector. Caernarfon airfield, in North Wales, Alf's version. - Good starting point. Altitude mismatches can occur when different scenery add-ons are combined. Here, before adjustment, buildings were not to be seen, but with my simple fix the only problem left is a "flying" hangar. See Refs. T=Tower, H=Hangars, B=Buildings, C=Cars, A=Aircrafts. - on Isle of Anglesey, Rhosneigr. With Hawks for training, and rescue helis: • Wiki RWY 14/32, 1/19, 8/26, PAPI DME, OM+MM FSX: some buildings. Relief landing ground for Valley. • Wiki RWY 4/22, VASI Light beacon tower. FSX: only tower. EGCK Caernarfon - south of Anglesey. - Good starting point in North. • Wiki RWY 8/26, (2/20) NDB 320 kHz CAE FSX: rwy + light beacon mast. - far east, near Liverpool. • Wiki RWY 5/23, PAPI, ILS NDB 340 kHz HAW. 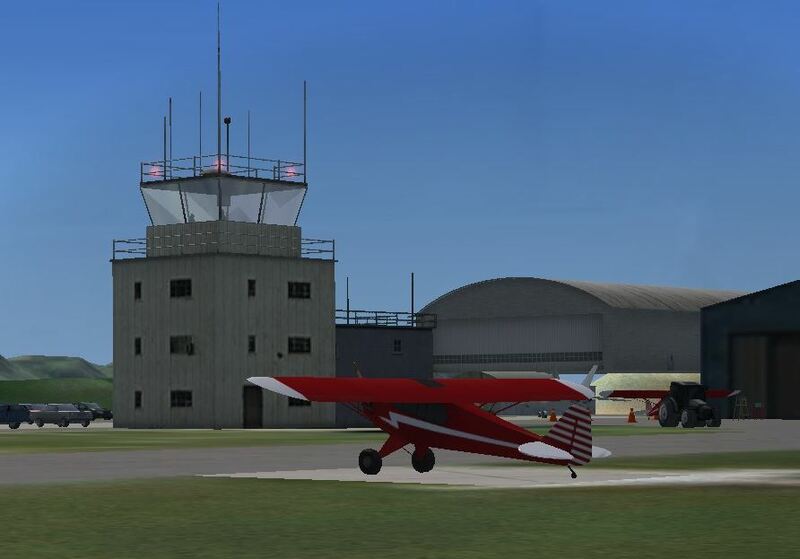 FSX: several buildings, no A.
PAPI 18/36 - FSX: only tower. Two parallell Rwy now closed (X). EGCW Welshpool - inland, near castle Powis. • Wiki RWY 4/22 NDB 323 kHz WPL, DME, APAPI(?) FSX: only rwy and radio equipment. T+2H+3A +surroundings: many B, powerline. - actually in the Midlands. • Wiki RWY 9/27, APAPI (2 lights) NDB 426 kHz SH FSX rwy and navaids, no B. - at Pembrokeshire northern coast. • Wiki RWY 8/26 NDB 370.5 kHz AP FSX rwy somewhat high. Light beacon tower FSX a few buildings(?). EGFP Pembrey. ex RAF base. • Wiki RWY 4/22 NDB 341 kHz PMB FSX fairly good. - Good starting point in South. • Wiki RWY 4/22, 10/28, X15/33 NDB 320.5 kHz SWN FSX has buildings (?). T+2H+10B+20C+3A (field raised, minor problem). EGDX St Athan, RAF base (until 2019) • Wiki RWY 8/26, PAPI DME FSX: only tower. - Detailed scenery by Terry Shields. 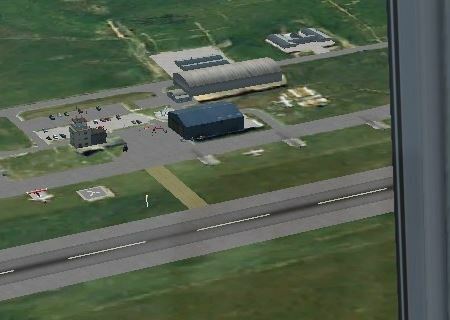 • Wiki RWY 12/30, PAPI, ILS NDB 388.5 kHz CDF, DME FSX: terminal,hangars. Isle of Man - 40 NM north Wales. Not in VFR Real scenery. (VOR is 4 NM west) FSX: good with terminal, hangars. 1. FSX Steam is much more stable than old FSX. It has better RAM memory handling. Use a SSD hard drive for FSX. Otherwise scenery load takes too long time. 2. How to buy: - You shall register an account at Steam. Then buy FSX alone, no addons at first purchase. Addons get installed into Steam-FSX folder FSX/DLG, which must first exist! 3. Check Settings: Screen to your screen size. Display settings to max or almost max! 4. Avoid double installation: FSX old + FSX-Steam. Creates problems, and old FSX is unstable. Uninstall of FSX clears in Registry, but does not erase files. Do that manually, and keep what you want. 5. Graphics card activation (Laptops mainly?). Check with Nvidia Geforce that fsx.exe is set to use GPU. If you check inside FSX for GPU use, it may wrongly show that it is not used, but it is! 6. Run in Window mode. Better than fullscreen, in my opinion: Alt+Enter swaps. 3=trim nose down, 4=trim nose up, 5=flaps out, 6=flaps in. Ctrl-Space = Reset view forward. but scenery reload takes time. - if FSX accepts it fills in name. Click OK - then a BUG: window stays up! BUG-FIX: click anywhere in a white space and it disappears. Done - now fly and test! 8c. Order: Scenery plotting order is down and up. Are they in good order? Turn off (unmark) sceneries you do not use. Mismatch is often a problem. What next? You may contribute! but it did not fit well into Photo scenery mesh (ground elevations). - Adjust and improve castles and ruins. Add: Pembroke castle, Castell y Bere ruin. - Add ships OK done: Ferries in Holyhead and Fishguard. Tankers in Milford Haven 4 OK. And Port Talbot. Aberthaw B power station, Uskmouth power station. Cardiff chemical tanks, Llyn Celyn reservoir dam. - Add David Morgan's castles Caernarfon, Harlech. - Add some aircrafts on RAF Valley and Mona - many standard jet trainers, 1-2 jets, some oldies?. - Aircraft - add zip-file for DragonRapide, with ADF. - Adjust Severn bridge western landing to roads i photo scenery (enough to change hdg?). - Bridges to Anglesey - Menai bridge and Britannia bridge - two very special ones! - Newport Transporter Bridge, over Usk river. - Dams for reservoirs, esp. those in Elan Valley. 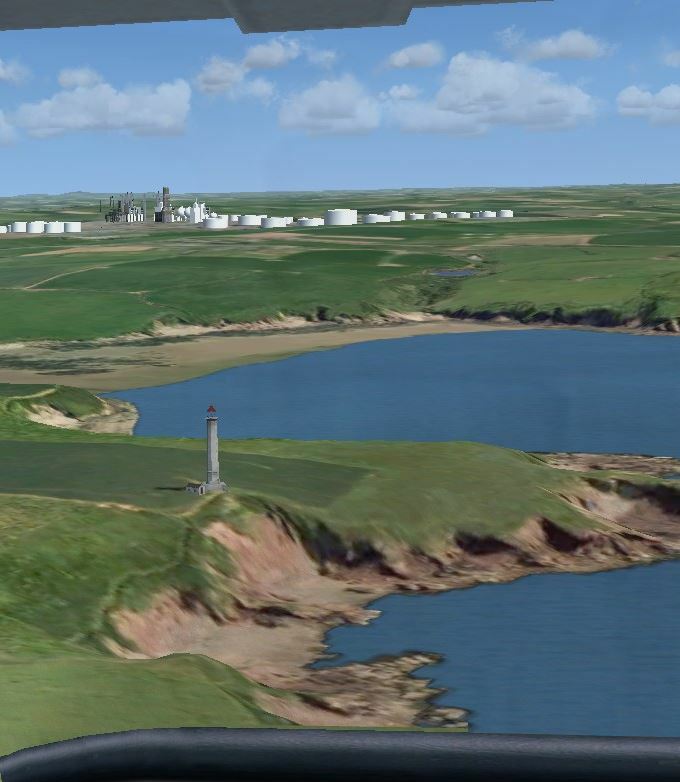 - Harbour: area_Fishguard.bkgl - add ferry and buildings. - Power stations: Wylfa nuclear at Cemaes, N Anglesey (1970-2015),..
and helis Sea King yellow, Sikorsky S92 white/red. N.B. Keep filesizes limited to a few MB each. AIP UK - with pro flight info. No navigation maps, they are for sale elsewhere. Wales - Aerodrome charts: Carnearfon, Haverfordwest, Pembrey, Shobdon, Swansea, Welshpool, WestWales/Aberporth. - For Cardiff and Hawarden also IFR info. 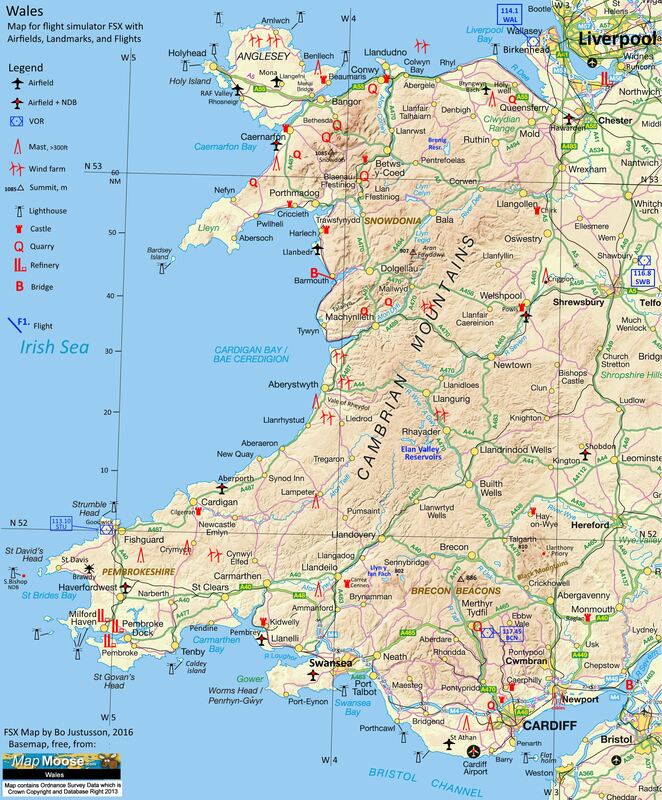 SkyVector Aeronautical Charts and Facts - UK Wales - very good info and maps. MapMoose.com - maps & apps for laptops, mobile phones. A new hangar has been built for two Sikorsky S-92 helicopters. Small airfields in the UK - by Alf Denham, packaged in Volumes 1-34 (2016). and some FSX generic objects. Each scenery file is self-contained. - Selected for combo file: EGCK Caernarfon, EGCW Welshpool, EGBS Shobdon, EGFA Aberporth, EGFH Swansea. Tested X7BB Bryngwyn Bach, a grass strip 6NM SE of Rhyl, but Rwy had too large altitude diffs. • Interview with Alf Denham at FlightSim.com - Alf describes his methods and tools, very informative! Inactivate cvx-files (exclusion files cvxNNNN.bgl) by renaming to say ._Xbgl . I used it for Caernarfon. EGFE Haverfordwest, by Anthony Meredith. - Anthony has also made a model of Brawdy, a closed RAF airbase east of St David's. Not included in my file, but the airfield is well visible in photo scenery. EGFF Cardiff airport - FSX has a reasonably good model with terminals and an aircraft. - In combo file: Cardiff airport, by Terry Shields, freeware 2.8MB. (with correction for St.Athans). - Another scenery is Cardiff airport, by Gary Summons/UK2000_Scenery, Basic Free 25MB, or Extreme 77MB. RAF airfields on Anglesey, by Gordon Barnes, at flightsim.com. - Mona RAF EGOQ 0.3MB. - See also large model for RAF Valley, link below. • Mid & South Wales: I have added 8 castles, using Chris' models. Bo Justusson. Preliminary version! - shall be adjusted in hdg and size. More realistic models would be welcomed! 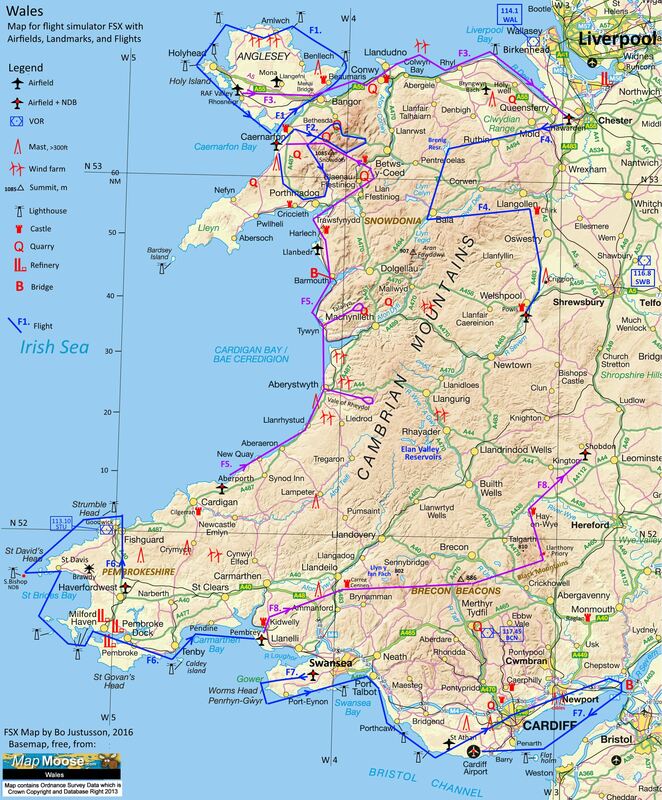 Chirk (SE Llangollen), Powis (Welshpool), Hay (in Hay-on-Wye), Cilgerran (S Cardigan), Carreg Cennen (Brecon Beacon, west), Raglan (N Newport, 10NM), Kidwelly (Pembrey airfield), Caerphilly (N Cardiff). • Cardiff castle and Tongwynlais castle (NW Cardiff) in Cardiff City scenery, by David Morgan. • Wind farm Llandudno, by Neil Birch, 8 Km off the coast. Masts, pylons and effect-smoke OK. But stacks, CWS, and cooling towers not visible. Missing Lib? • FSX: Radio mast (tower) i FSX, S.Caernarfon, doubles? Exclude, or keep as example? N.B. mast+tower at Carmel and Haverfordwest. I checked Transmitting stations, all high are included above. ano_Pylon_USKMOUTH.BGL (2 pylons S.Newport) - add power station! - Port Talbot (stack) SE.Swansea, effect? - Usk Mouth (stack) S.Newport. Lighthouses around Wales, Bo Justusson. Standard FSX objects are used, hence only look-alikes. - (South Coast:) Caldey Island, Mumbles Head, Nash Point, Flat Holm (island). Remark: "holm" is from nordic language = "small island" - viking influence! - Stockholm is my home town! Then added airport symbols, landmark symbols and flights, in separate image layers. Software used was: Paint.net - a freeware similar to MS Paint but more advanced. Zoom: Map image size is W=2070 H=2500, so you can increase webpage size 200% (Ctrl +). FreewareScnenery.com - Links for UK - and for many other countries! - The webpage you are reading now is for Vol 3. Wales & South West England. • Just Flight UK airport and airfield scenery packages - from Gary Summons, UK2000. - Not tested by me. Check reviews and compatibility with Photo sceneries. - Vol.1. Southern England and S Wales. - Vol.2 Mid dito. - Vol 3 Northern dito. - Vol. 4-5 Scotland. - Not tested by me. Orbx fullterrain.com - FTX EU Wales - High quality land class based scenery, with many landmark objects. Treescapes - autogen trees added to photo sceneries. - Not tested by me. Pros: better 3D feeling. Cons: not the real world anymore. FlightStore.co.uk - SALE of Horizons VFR, Airfields UK, and Treescapes - DVD-versions (seen in April 2016). - Not tested by me. Pros: better 3D feeling. Cons: standard buildings. 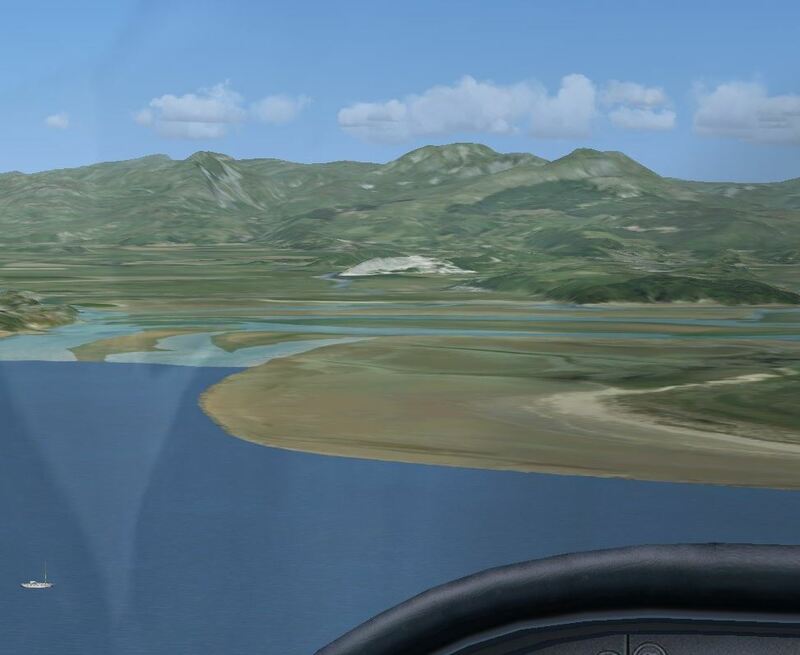 The Sim720 team has made a detailed Caernarfon airport with surroundings(5x4km), sold on Steam. They have added houses and trees with correct sizes. It is instructive to compare that with pure photo scenery! One good use of detailed surroundings is when you are training landings. Similar addons covering large areas are Treescape and VFR Buildings. Pros are better 3D perception, cons are more synthetic visualization.